Originally the long-time guitarist of the popular CCM band FFH in the late 90’s and early 2000’s; Michael Boggs has excelled in his career, now culminating in his second solo album called More Like A Lion. Skilfully playing guitar in a band likened to Point Of Grace and Avalon in style and genre; now Michael steps out into his own genre, which is a bit of pop mixed with country and southern gospel roots (I haven’t had the pleasure of hearing 2010’s More Than Moved). 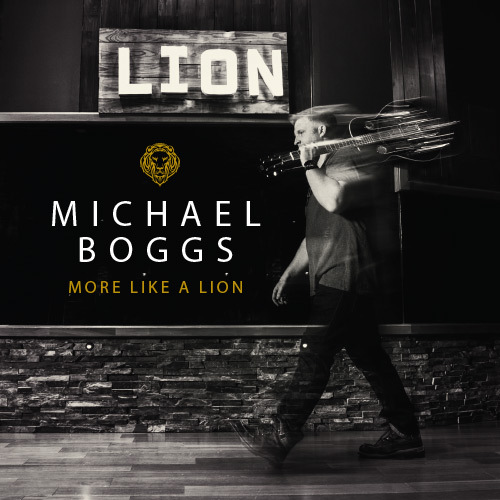 With Michael’s commanding voice and musical style reminding me of Jason Crabb, Matt Maher, Third Day and Rhett Walker Band, it is this wide range of songs on this album that has drawn me in, and is sure to capture the attention of others. Providing us with unwavering biblical truths wrapped up in emotional and poignant melodies and songs for corporate worship to Jesus; Michael gives us reason to rejoice and be glad, reminding us that Jesus is with us every single day of our lives. Thus we can confidently worship our Lord and Saviour, and commune with our brothers and sisters in Christ. From the Hillsong “Man Of Sorrows” reminiscent original hymn “Deep, Deep Love”, to the Matt Maher co-written “Turn Around” and the emotional and heart pulling title track; More Like a Lion is definitely for you if enjoy worship with a country style that’s still firmly rooted in the scriptures! “Turn Around” co-written with Matt Maher, is first. Sung with a commanding authority and a country twang, and employing a distinct southern gospel style, Michael oozes out unbridled passion and fervour, and stays quite close to the original recording, and in my opinion enhances it through the addition of more instruments and the presence of the electric guitar at the forefront of the song. Skilfully telling a story of people in the verses who feel like they’re too far for God’s grace to cover them, Michael reassures us that ‘…if you’re scared that you don’t matter, If you’re lost and need to be found, if you’re looking for a Saviour, all you gotta do is turn around…’, unobtrusively reminding us that we don’t need to be perfect and good for God to accept us; He just does, because of His unending love for us. Poignant and moving, and alluding to the parable of the lost son in the bridge; the fantastic opener “Turn Around” segues into many more inspiring melodies! “Our Hallelujah”, sung in a folk/acoustic atmosphere to begin with then crescendoing into an all-out worship anthem through the presence of the electric guitar and mesmerising drums, speaks about us owning our relationship with God and that no one can take our hallelujah, our praises to God, even when we live in a dual nature of being a criminal and a king in this world, and even when the world tells us we’re unworthy. Michael has written and delivered a song to encourage and lift us up, with his songwriting prowess shown through the juxtapositioning of words with polar opposite meanings in the verses, to make the point that Christ has washed us clan and that because of His death on the cross, we can now live in communion and relationship with Him. A confronting yet comforting song, “Rise” and “Alive” follow and are equally as emphatic and powerful. While the acoustic guitar driven “Rise” (which swells to an epically majestic orchestral type song during the bridge) has the potential to be a modern hymn, similar to Matt Redman’s “10 000 Reasons”, and vividly delves into Jesus’ death on the cross and resurrection, outlining the significance for our lives, as we realise how much we’ve gained by Jesus’’ sacrifice, with Michael emotionally crying out ‘…oh, He’s alive, oh, Jesus Christ, the sinless one You paid the price, it is done, in Christ we rise…’; “Alive” (preceded by the 30 second “The Resurrection and The Life”, a reading of Jesus’ words in John 11:25-26), has Michael exploring the country and bluegrass genre a bit more. Opting for a more organic and folk atmosphere, complete with hand claps and the presence of a banjo (at least I think that’s what’s on the background…), Michael relays to us that Jesus’s primary purpose when coming to Earth was to make the dead come to life (in a spiritual sense) and it is through this song that “I feel a sense of gratitude; thanks Michael for creating these gems and treasures! “Heart on my Sleeve”, led by light percussion and acoustic guitar, is as personal and vulnerable as they come, with Michael sings about falling on his knees, surrendering our plans to God, and worshipping our Saviour in gratitude and adoration because of everything He’s done for us. Sung in a mellow and reverent atmosphere, this track is more suited for personal rather than corporate worship, however it doesn’t make the emotion from Michael less real, in fact this is probably one of the most meaningful and lyrically poignant songs on the album. Being honest in all facets of our life may not be realistic but Michal reminds us that with God, all things are possible. While “Head To The Heart”, led by the guitars and an effervescent and lively tempo, outlines how we as Christians should remember to live out our faith in our actions rather than knowing all the head knowledge (sort of like Mark Hall’s analysis on roots and reach as well as James 2:14-26, the passage on faith v works), and is very confronting yet refreshing as Michael reminds us that through relationship with Jesus, our faith will be solidified on our hearts as well as our heads; “Song In Me”, a rousing mid tmepo country ballad led by the electric guitar, has Michael singing in riddles, as on the surface this is a love song from a man to a woman, as Michael outlines that ‘…I want to sing outloud, cause you’re the song in me, your touch is a beautiful symphony…’, yet a deeper look could be us singing to God our devotion and gratitude. Though I am not as familiar with the country genre as many others, Michael’s take on this genre is pretty spot on in my opinion. The album ends with the slow tempo worship anthem “We Will Sing Jesus” where Michael emphatically sings and proclaims against the backdrop of a choir and a stirring crescendo to epic heights of musical brilliance ‘…Jesus, name above all names, oh all the glory, honour, power be to the only risen King, His presence will never leave us, oh He is our song, we will sing Jesus…’ and the subdued and serene acoustic piece “What I Already Know”, showing us the revelation that more faith in Jesus is all that we need to believe, rather than signs and wonders showered upon us by God; however Michael’s most talked about songs have yet to be discussed. “Deep, Deep Love” is most likely going to raise some eyebrows, and have people scratching their heads, as it sounds musically 100% similar to Hillsong’s “Man Of Sorrows” (and even lyrically borrowing some themes from the track too!). Though it took me by surprise in its musical similarity, “Deep, Deep Love” however is as good a track that Michael has ever recorded, with the age-old hymn speaking out God’s deep love for us, exclaiming that ‘…oh the deep, deep love of Jesus, oh how vast, unmeasured and free, all my days my heart will sing of his deep, deep love for me….’. Maybe it’s because the tune is so familiar but I like Michael’s version of the song on the whole rather than Hillsong’s! But the title track, the album’s first single, driven by stirring keys and pulsating drums, is where Michael shines the most lyrically and vocally. “What Would Jesus Undo?” (so popular that it has been made into 2 music videos!) is quite a confronting melody, as Michael poses question after question, about what Jesus could and might undo if He lived during the 21st century, and seen all the things Christians were doing in His name (namely war), as well as how Christians are treated in the world today. It’s no secret that on mainstream news, songs and radio, that Christianity is ridiculed, and people have an obscured and tainted view of the church, and I believe that if Jesus were alive walking around today and building His ministry, things would be a whole lot different. This is definitely what Michael is trying to convey, and I commend his greatly for giving us issues and questions to ponder over. Well done Michael for creating 12 treasures destined to be discussion points for some listeners and providing healing and breakthrough for others, in an album that is music versatile as well as lyrically and thematically relevant to the issues at hand today. More Like A Lion is a great album, and probably the best debut album in my opinion since Tenth Avenue North’s Over And Underneath. Michael Boggs has given us potent, emotive, comforting, relaxing, upbeat and moving songs, and his ease at ‘switching genres and styles’ is very commendable. Sure to create controversy as well as getting us to look deep down into ourselves, examining our relationships with each other and with God; Michael’s full length studio album of his September 2013 EP, is a reminder that southern/gospel music can be fun and can indeed have a positive impact and contain messages transcending the possible and material. Well done Michael for a thought-provoking album that will be on my iTunes player for a while yet, at least until Michael’s next album! He reminds somehow of Warren Barfield. I love the song: What Would Jesus Undo? It speaks a lot. Yeah that song is one of my favourites as well! I can’t decide which of the two music videos I like better!